When writing resumes, it's important to keep in mind why employers hire. 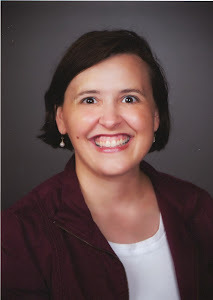 In her book, "Resume Magic" (now in its 4th edition!) Susan Britton Whitcomb outlines the 12 "Employer Buying Motivators" -- really, the reason why employers need employees. Keep these 12 motivators in mind when writing the resume and target the client's accomplishments towards how they can help the employer meet these 12 objectives. Are You Risking Your LinkedIn Account to 'Help' Clients? I pulled up Facebook today and saw a post from a colleague that said, "Logged into LinkedIn this morning under a client's account and..." and I stopped reading. 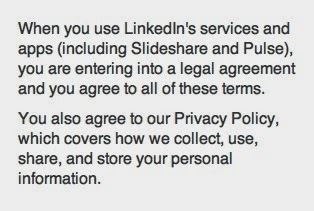 The prohibition against signing into someone else's account is actually listed twice in the LinkedIn Terms of Service. 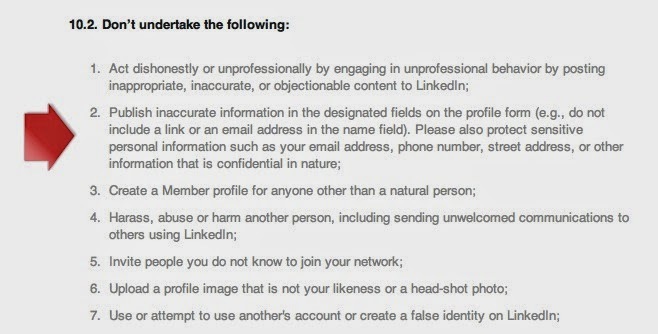 But people violate LinkedIn's Terms of Service all the time, don't they? 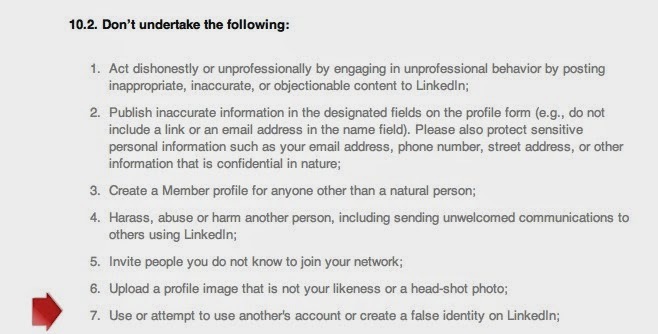 Also under section 10.2, it says you can't "Publish inaccurate information in the designated fields on the profile form (e.g., do not include a link or an email address in the name field)." Because everyone else -- including some of the biggest names in the resume writing industry -- are doing it, it's okay if you do it too, right? Growing up, my Mom always said, "Well, if everyone else jumped off a cliff, would you?" My personal stance on this is no, we should not be logging into client's LinkedIn accounts and updating their profiles. Ever. Do you want to risk your personal LinkedIn account? And your client's? Your client is relying on you to provide them with advice. If you tell them it's okay for you to log in to their account and their account gets shut down, are you putting yourself at risk? Yes. In theory, your client could sue you. I understand that people will say that they "don't have time" to do this themselves -- but just having a static LinkedIn profile isn't going to really benefit them. If they don't know how to manage their own LI profile, they probably shouldn't be on LI at all. It's better to NOT be on LI than to put something up there they don't use. I liken it to the role of the resume in the job search. 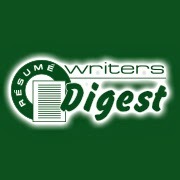 We help clients come up with the content (resume, cover letter, bio, LI profile content, etc.) but once we've created it, it's up to the client to actually USE it. We don't go on the job interviews for them. We give them the tools but they must use them. One way to emphasize this to "busy" clients is, "This is the difference between teaching a man to fish, and giving him a fish. I know you just want the fish, but I'm not doing you a favor if you don't learn how to use these tools as part of a bigger career management strategy. The benefit to being on LinkedIn isn't just having a great Headline and Summary -- it's engaging in Groups, giving and getting Recommendations, making Connections, and building a pond that is well stocked with fish for the future. I'm asking you to take an hour now to learn how to use LinkedIn, and 10-15 minutes a week going forward to manage your account so that you won't go 'hungry' in your job search again in the future." You can give them resources that will TEACH them how to use LinkedIn. You can purchase my LinkedIn Pass-Along Materials -- a 40+-page step-by-step guide to help them set up and manage their LinkedIn account. For $20, you can put your name on it and use it with all your clients (contact me for details -- currently updating it for the "new look" LinkedIn for 2017). If the client is truly *that busy,* they probably have an assistant or someone they can give your LinkedIn Profile Delivery Document to (or maybe their wife or kid) who can implement it for them. But I personally would not risk my LinkedIn presence for any of my clients. And I don't think you should either. In a Resume Writing Rut? Here's Eight Ways to Boost Your Creativity! Feeling creativity drained? Stuck in a resume writing rut? Today's blog post will give you eight ways to boost your creativity. You ARE creative -- you just have to let your creativity out! There are a lot of things we do every day without even thinking. We get up, shower, brush our teeth and go about our lives mostly on autopilot. Try getting up in the morning with a new mindfulness about even the most mundane activities. Think about how your sheets feel on your body right before you get up; think about how the shower water feels; think about how the toothpaste smells and tastes, and so forth. Take new pleasure in everyday experiences and really be "in the moment" as you experience them. If you drive to the store the same way each time, take a different route. If you have a viewpoint in life that is different from a friend's, take the time to give their world view some consideration. You don't have to tell them; it's simply a practice to looking at the world through a different lens, which might bring rise to new ideas and thoughts that you never allowed yourself to experience before. If you're working on a resume and feeling stuck, get up and get out. Go for a brisk walk. While you are walking, try not to think of anything but your walk for the first couple of minutes. After that, it's okay to think of the resume and brainstorm ideas as you walk. You might consider bringing a recording device with you so that you won't forget anything that comes to mind. Often, taking the pressure off is the best way to become more creative. One of the best things about working for yourself is the ability to change your environment. You can take your laptop to the park or the local coffee shop to do some work. Need a bigger change? Try cleaning up your office, painting it a new color, and moving around the furniture. Change helps your mind work better. Take a class; read a book; go to a conference. However you choose to do it, learn something new. It's important that you are always learning and growing. What you learn doesn't actually even have to be related to resume writing. It can be something just for you -- such as learning how to garden, or golf. It can also be something that helps you more directly in your business such as learning how to incorporate passive income into your resume writing business. The important factor is that you make it formal enough that you do it regularly and once you've learned, move on to learning something else new. Yes, walking is moving, but you need more regular exercise in your life than a walk when you are frustrated or blocked. People who work at a desk and sit for more than four hours a day are at a higher risk of sudden death than those who have other types of jobs. The scary part is, many of us sit for more than 11 hours a day, which increases your risk of death early by 40 percent. Join a regular exercise plan or create your own regiment, and then get up every 90 to 100 minutes and move around for 10 minutes -- or buy a standing desk. The brain needs glucose to think. That's why you crave all that sugar when you are doing a lot of work and really want to stuff your face with chocolate or ice cream or both. Give yourself permission to eat more fruit while you're working, and you'll find that your brain works better. Studies show that people who eat sweets during or before a test perform better. Make the sweet something healthy like a banana or a sweet juicy peach. A green smoothie is even better. Sometimes being more creative is simply a matter of going from thinking to doing. The truth is there is no such thing as a creative block. You've likely heard of "writer's block" but have you ever heard of "Cashier's Block" or "Doctor's Block" or seriously any other career that gives you an excuse not to get to work other than so-called creative professions? These blocks really don't exist. Your creativity is there for you on command as soon as you accept that it is. Try these eight ways to boost your creativity! Do you have a tip for how to feel more creative? Share it in the comments below!